For other uses, see Little Giant (disambiguation). Little Giants is a 1994 American family sports comedy film, starring Rick Moranis and Ed O'Neill as brothers in a small Ohio town, coaching rival Pee-Wee Football teams. Danny O'Shea (Rick Moranis) has always lived in the shadow of his older brother, Kevin (Ed O'Neill), a Heisman Trophy winner and a local football hero. They live in their hometown of Urbania, Ohio. Kevin coaches the local "Pee-Wee Cowboys" football team. Despite being the best player, Danny's tomboy daughter, Becky (Shawna Waldron), nicknamed Icebox, is cut during try outs because she is a girl. Also cut are her less-talented friends, Rashid Hanon (who can't catch anything), Tad Simpson (who can't run), and Rudy Zolteck (who's overweight and quite flatuent). After being ridiculed by the other players who made the team, she convinces her dad to coach a new pee-wee team of their own. At first, Danny is reluctant to do so, but later accepts in an attempt to show Urbania that Kevin is not invincible, and that there is another O'Shea in town capable of winning. Kevin mockingly reminds him of the "one town, one team" rule and with the help of the locals, they decide to have a playoff game to determine the lone team that will represent Urbania. Among Becky, Hanon, Tad, Rudy, and Nubie (an intelligent boy who becomes assistant coach), Danny also gathers other children that have never been given a chance and dubs the team the "Little Giants." One such player is Junior Floyd (Devon Sawa), a strong-armed quarterback who turns out to be the son of Danny's childhood crush, Patty Floyd (Susanna Thompson). Becky slowly develops a crush on him and struggles with her newfound feelings as a girl. Two old-timers, Orville (Harry Fleer) and Wilbur (Dabbs Greer), encourage the rivalry between Danny and Kevin by reporting to them that a new star player, Spike Hammersmith (Sam Horrigan), has just moved to Urbania. Danny succeeds at recruiting him by tricking his overzealous father, Mike (Brian Haley), that he is the famous "Coach O'Shea", but this is a problem as Spike proves to be rude, arrogant, and refuses to play on a team with a girl. The deception is later discovered and he switches over to Kevin's more well-structured team. Kevin also encourages his daughter, Debbie (Courtney Peldon), to be a cheerleader and later convinces Becky that a quarterback will want to date a cheerleader, not a teammate. Realizing it is her best chance to win over Junior, she decides to quit the team and pursue cheerleading. Just as Danny's team start to lose hope, a bus arrives carrying NFL stars John Madden, Emmitt Smith, Bruce Smith, Tim Brown, and Steve Emtman. They teach and inspire the young players into believing they can win. On the day of the game, Kevin chastises Danny into making an impulsive bet. If Danny wins, he gets Kevin's Chevrolet dealership; if Kevin wins, he gets Danny's gas station. Facing a 21-point halftime deficit, the Giants are lifted when Danny asks them to individually recall a time when they had a proud accomplishment and reassures them that all it takes is "one time" to beat the Cowboys. With this, they begin to make a big comeback with a series of outstanding and unexpected plays. Realizing that Junior is the main threat to them, Spike, under orders from Mike, injures him by spearing him with his helmet after the whistle, which even Kevin considers disgraceful, unsportsmanlike conduct. Witnessing from the sidelines, an enraged Becky drops her pompoms and suits up for the game. She immediately makes an impact when she forces a fumble after a jarring hit on Spike. Other Giants make touchdowns in tandem with overcoming personal problems, such as Hanon's fear of dropping passes and making a reception, or another one running towards the goal line when his little-seen dad has come to watch him play. In the game's closing seconds with the score tied at 21 all, the Giants make a goal line stand and stop Spike. With time remaining for one final play, their offense steps back onto the field and uses a trick play Nubie calls "The Annexation of Puerto Rico," inspired by one of Madden's plays at Super Bowl XI. Kevin shouts out its actual name as it occurs, shouting "Fumblerooski, Fumblerooski!" The play includes three different ball carriers, utilizing the hook and lateral from Zolteck, to Junior, and finally to Berman, who scores the Giants' 99 yard game-winning touchdown. Afterwards, Danny says that rather than having the Giants solely represent Urbania, they should merge with the Cowboys, and both he and Kevin can coach the team. Danny and Patty rekindle their childhood romance. He also decides not to hold Kevin to the prior bet, on the condition that the town water tower be changed from "Home of Kevin O'Shea" to "Home of The O'Shea Brothers," reflecting a much earlier promise that Kevin made to Danny from their childhood. Marcus Toji - Marcus "The Toe"
The film was inspired by a 1992 McDonald's Super Bowl commercial developed by Jim Ferguson and Bob Shallcross. According to the Baltimore Sun, after seeing the commercial, Steven Spielberg contacted them and said, "I want that commercial made into a movie. I want my 'Home Alone.'" The film received mixed reviews. Stephen Holden remarked, in The New York Times, that "anyone who was ever rejected or picked last for a team can relate to the concept behind "Little Giants," a slickly contrived family movie about an inept junior football team that succeeds in spite of spectacular liabilities [...] In typical Hollywood fashion, "Little Giants" raises issues about competition, machismo and sexism in American sports, then blithely skirts them in confrontations that let everyone have his cake and eat it too [...] "Little Giants," which was directed by Duwayne Dunham, devotes much of its energy to such comic antics as balls getting stuck into face masks, and wispy little kids practicing looking intimidating." The Washington Post stated that "if "Little Giants" were in a beauty pageant it might win votes for Miss Congeniality, but it definitely wouldn't take the crown." Conversely, the Los Angeles Times suggested that the film was "smarter than many of its ilk. Clearly a great deal of care and thought has gone into making special a picture that could so easily have been routine family fare." Little Giants currently holds a 40% rating on Rotten Tomatoes. The film had a budget of $20 million, but barely abled to recoup with a total of $19.3 million in box office sales. In a 2010 NCAA football game, Michigan State defeated Notre Dame on a fake field goal touchdown pass in overtime to end the game. Head coach Mark Dantonio said the play was called "Little Giants." The uniforms worn by the Cowboys in the film were the same ones worn by the Dallas Cowboys during the 1994 season as part of the NFL's 75th anniversary. From 2004-2007, the New York Giants' alternate jerseys were red with white numerals, similar to the jerseys worn by the Little Giants in the movie. The Annexation of Puerto Rico play was actually used during the December 18, 2011 game between the Carolina Panthers and the Houston Texans. ↑ Judy Brennan (1994-08-21). "PEEWEES' PLAYHOUSE : New Quarterback Takes 'Little Giants' Toward Goal - Los Angeles Times". Articles.latimes.com. Retrieved 2012-07-16. ↑ "8 Things Even Football Fans Don't Know About The Super Bowl". Huffington Post. 2015-01-30. ↑ Holden, Stephen (1994-10-14). 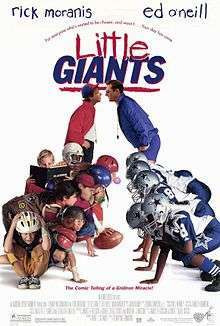 "Little Giants (1994) FILM REVIEW; Extra Points For Trying". Movies.nytimes.com. Retrieved 2012-07-16. ↑ "'Little Giants' (PG)". Washingtonpost.com. 1994-10-17. Retrieved 2012-07-16. ↑ Thomas, Kevin (1994-10-14). "MOVIE REVIEW : 'Giants': A Comedy Worthy of Cheers - Los Angeles Times". Articles.latimes.com. Retrieved 2012-07-16. ↑ ROBERT W. WELKOS (1994-10-18). "Weekend Box Office : 'Fiction' Outdraws 'The Specialist' - Los Angeles Times". Articles.latimes.com. Retrieved 2012-07-16. ↑ ROBERT W. WELKOS (1994-10-25). "Weekend Box Office : 'Pulp Fiction' Stays in No. 1 - Los Angeles Times". Articles.latimes.com. Retrieved 2012-07-16. ↑ ELAINE DUTKA (1988-01-26). "Weekend Box Office : 'Stargate' Has MGM Starry-Eyed - Los Angeles Times". Articles.latimes.com. Retrieved 2012-07-16. ↑ ROBERT W. WELKOS (1994-11-08). "Weekend Box Office : 'Stargate' a Back-to-Back Champ - Los Angeles Times". Articles.latimes.com. Retrieved 2012-07-16.